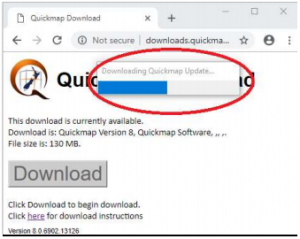 These instruction describe how to install or update Quickmap version 8 software by downloading the software install from the internet. Both of the above options are valid for terminal servers. This article covers the Standalone installation, see this article for information on how to install Quickmap in a Client-Server configuration. After you have clicked on the download link provided to you by Custom Software Limited, or pasted the URL into your web browser, a webpage similar to the screenshot below will be displayed. This screen will tell you what you are going to download, and how big the download is. Run the download. 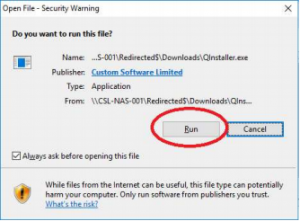 ❗ Do NOT attempt to run QInstaller.exe as administrator (The software gathers essential information about the user’s drive mappings, and will elevate to Administrator later when required). Wait for the download to finish. This should take around 2 minutes. When the download has completed, you may be prompted to enter your administrator login credentials to begin the install of the download. Enter your administrator login and password if necessary. The first installer form will display. Click the Next button and follow through the prompts until you arrive at the Feature Selection page. On the Feature Selection page, choose Software and Data to install both on your machine (if you have a separate URL for data, you may only have the option for Software here, in which case, select Software Only). Continue to click through the prompts to complete the install, optionally changing the location of the data or software if you wish (you may not be able to change the location of the data, if data is already installed). ❗ Note: On some versions of windows, you may receive a message suggesting that the program may not have installed correctly. If this message appears, click This program installed correctly. 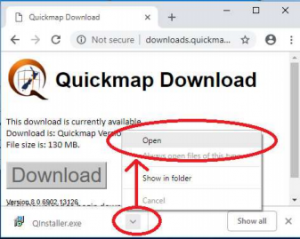 If you have been sent a URL for a Quickmap data download, and have not yet downloaded the data update, then paste the second URL into your web browser, and then follow the prompts, which will be similar to these instructions. This entry was posted in Knowledge Base and tagged Installation, Quickmap Version 8 by Webmaster. Bookmark the permalink.